Born in 1919 in a tepee near Cherry Creek, Chief David Bald Eagle has ridden in 76 Days of '76 parades. This year may be his last. Chief David Beautiful Bald Eagle will ride in this week's Days of '76 parade, the 77th time he has participated in the annual celebration. 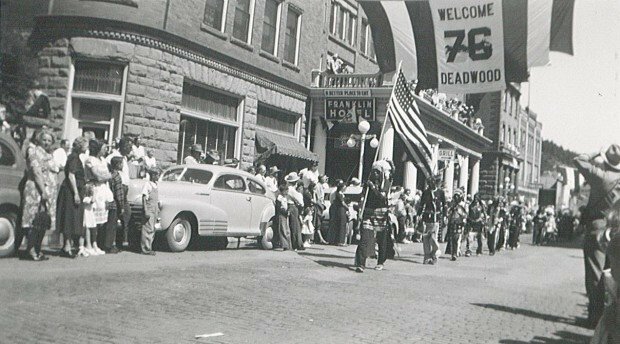 Here, Native Americans pass the historic Franklin Hotel in in an early parade, circa 1940. Chief David Beautiful Bald Eagle in full regalia, as he appears when riding in Deadwood's annual Days of '76 parade. Chief David Bald Eagle signs a DVD of "Captain Blood" starring Errol Flynn. Costumed in a black wig, mustache and goatee, Bald Eagle played Flynn's bodyguard in the 1935 swashbuckler. "I was the first Indian sword-fighter," Bald Eagle says with a laugh. Visitors to Chief David Bald Eagle's 2,500-acre ranch near Cherry Creek are greeted by a sign in Lakota. Horses run across the prairie on Chief Dave Bald Eagle's 2,500-acre ranch near Cherry Creek. Visitors to Chief David Bald Eagle's 2,500-acre ranch near Cherry Creek are greeted by a sign with one side in English and the other in Lakota. Born in 1919 in a tepee near Cherry Creek, Chief David Bald Eagle has ridden in 76 Days of '76 parades in Deadwood. CHERRY CREEK | Chief David Beautiful Bald Eagle sits in the crowded kitchen of his isolated ranch house, surrounded by mementos of his storied life. Four tribal chieftans wait in his living room. He is in no hurry. At 94 years of age, life has taught him to slow down and savor the twilight of his long and colorful life. Outside, his painted ponies endure the 96-degree heat of this July day, swatting flies with their tails and seeking scarce shade. Inside, Bald Eagle relishes the cool breeze of his window air conditioner as he tells his visitor of his earliest visit to the Days of ’76 celebration in Deadwood. 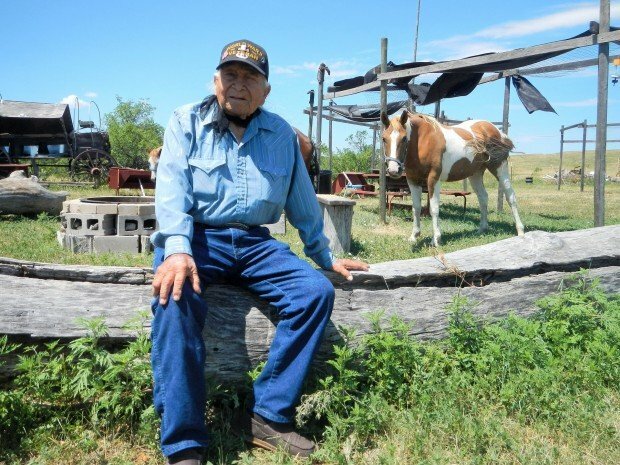 “I was about 10 years old, and I was riding in a wagon,” said the traditional chief of the Minnicoujou Tribe, who was born in a tepee in 1919. “There were five or six wagons of Native peoples riding in full costume in the parade. After the Days of ’76, we would return in a wagon train to our reservations. All told, Bald Eagle has ridden in 76 Days of ’76 parades. And he said this week’s Deadwood celebration is likely to be his last. Days of ’76 General Chairman Dawn Burns said her committee is always pleased when Chief Bald Eagle participates in the town’s annual celebration and dismissed his statement that this may be his last parade. Beyond the horse ride down Deadwood’s historic Main Street each July, Bald Eagle has had many days of distinction. Bald Eagle is the grandson Chief White Bull, who is a cousin of Sitting Bull, and White Feather. Both of those men fought in the Battle of Little Big Horn. Bald Eagle himself enlisted in the horse cavalry at Fort Meade in 1939 and parachuted into Normandy with the 82nd Airborne during D-Day when he was severely wounded. At a meeting in Puerto Rico about 15 years ago, Bald Eagle was made First Chief of the United Indigenous Nations, a society of chiefs from reservations around the globe. When one of his fellow leaders said to him, “Chief, you are not standing alone,” Bald Eagle accepted the honor and addressed more than 900 attendees. Since then, Bald Eagle has been asked to address and to visit indigenous people around the world. It is not unlike today, when tribal leaders from South Dakota reservations patiently wait in his living room for counsel from a man who may not be long for this world. “They want last-minute advice from me,” he said matter of factly. “Ever since I have been a chief, I have wanted to tell people the truth and that’s what I’ve been doing — bringing the truth out. This week, in perhaps one last hoorah, Bald Eagle will return to the Deadwood celebration that has captivated his attention each July for more than three-quarters of a century.